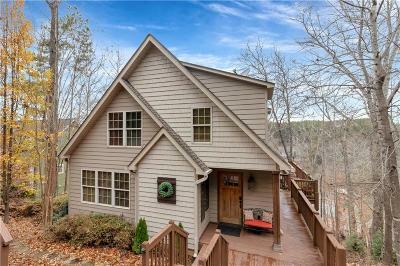 Beautiful waterfront home on Lake Keowee, located in Keowee Key, a gated country club in Western South Carolina. This waterfront home is move-in ready! The main floor offers wood flooring, vaulted wood ceilings, a gas log fireplace, and exposed beams to set the tone for a lovely retreat. This home is perfect for the family seeking a modern, well appointed waterfront home in the Keowee Key community. 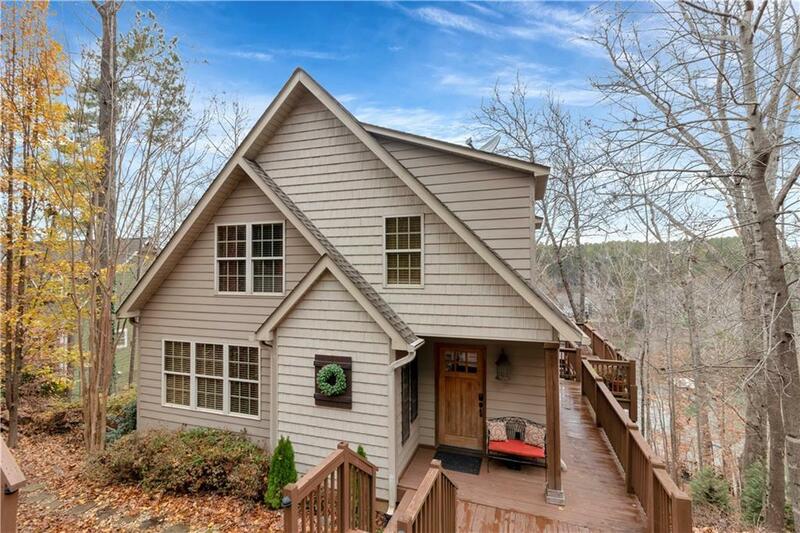 Two large porches overlooking the lake, provides tons of space for entertaining. The slate floors on the lower level allow for easy in-and-out to the water, while taking advantage of the recreation space, great room with surround sound, kitchenette, laundry, bedroom and bath. The upper level hosts 2 more bedrooms and a 3rd bathroom. In addition to the main level porch and lower level screen porch, there is a patio near the water, perfect for your fire pit, and a full-size cover dock with a lift and a remotely operated electric cover for your boat. The dock has a wide, uncovered side to accommodate your lounge chairs. The professionally installed stone steps take you from the house to the patio and dock. Whether you are looking for a full-time residence or a weekend getaway, this home has plenty to offer. If you enjoy the Clemson Tiger sporting events, this home is perfect for you, with approximately a 30-minute drive to Clemson. Keowee Key is a gated community on Lake Keowee in Western South Carolina. The community amenities include an 18-hole golf course, originally designed by George Cobb, Keowee Keyâs golf course was renovated by Pinehurst architect Richard Mandell, ranking in Golf Digestâs Top 10 courses of South Carolina. An extensive fitness center offers fitness classes, an indoor pool, racket ball courts, fourteen tennis courts, and four pickle ball courts. Restaurants include the Club and the Bistro. Additional amenities include boating facilities, including gas pump, and docks, two outdoor swimming pools, walking trails, lakeside beaches and parks, a dog park, community gardens area, shuffle board courts and many social groups and organizations that enhance and satisfy the many interests of its residents. Annual membership fee for 2018 is only $4,074 with a one-time New Owner Capital Assessment fee of $2,685. Additional fee information can be found in the supplemental documents.